Kudelik, Gail. "Red Coat Trail". The Canadian Encyclopedia, 22 June 2015, Historica Canada. https://www.thecanadianencyclopedia.ca/en/article/red-coat-trail. Accessed 24 April 2019. A number of highways in southern Manitoba, Saskatchewan and Alberta roughly follow the original route. The ride was re-enacted in 1999, the 125th anniversary of the march. The Red Coat Trail is a 1300-km route that approximates the path taken in 1874 by the North-West Mounted Police in their "March West" to bring law and order to the Canadian West. 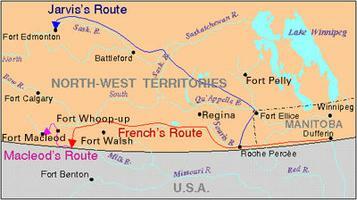 From Fort Dufferin (now Emerson, Man) they followed the Boundary Trail to La Roche Percée, Sask. There the force split up, with part of it going on to Fort Edmonton and the main force continuing to Fort Whoop-Up. Finding the fort abandoned, they continued westward to an island on the Oldman River where they established Fort Macleod.